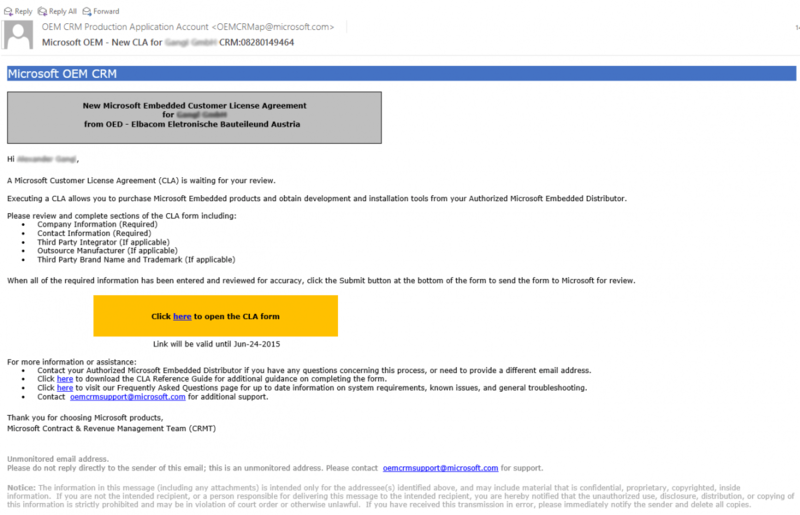 Today, OEM customers are doing business with Microsoft under Customer License Agreement (CLA) version 6.0. To align with Global Partner Agreement terms, CLA 6.0 will be replaced with CLA version 7.0, commencing on August 1st 2018. 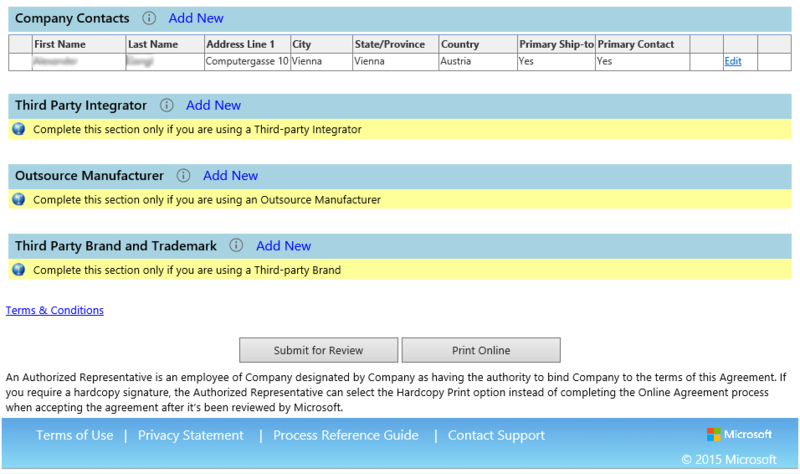 OEMs should review the new Terms and Conditions and then Click to Accept when ready to renew. This needs to be done by 30th June 2019. Microsoft will send regular reminder emails to those who have not renewed. Will CLA 6.0 be available to download after 1st August, 2018? Click on this link and your CLA will open. Scroll to the bottom of your CLA and you will see the Terms and Conditions that you ticked, along with Print Online and Print Hard Copy Buttons as shown below. Select the “Print Online” option and then select Print to PDF and this will save a Soft Copy to your Device or Server location selected. If you find that when you click on the Link in your last email, you get the below error, this is because the link has expired. To get a new link, contact your Microsoft Authorised Distributor or email oemcrmsupport@microsoft.com. A new link will be sent to the primary contact listed on your CLA. Once you receive the new link you can then follow Steps 1 – 4 to get a soft copy of your CLA. When will CLA version 7.0 be available to review? What to do on the CLA Website? 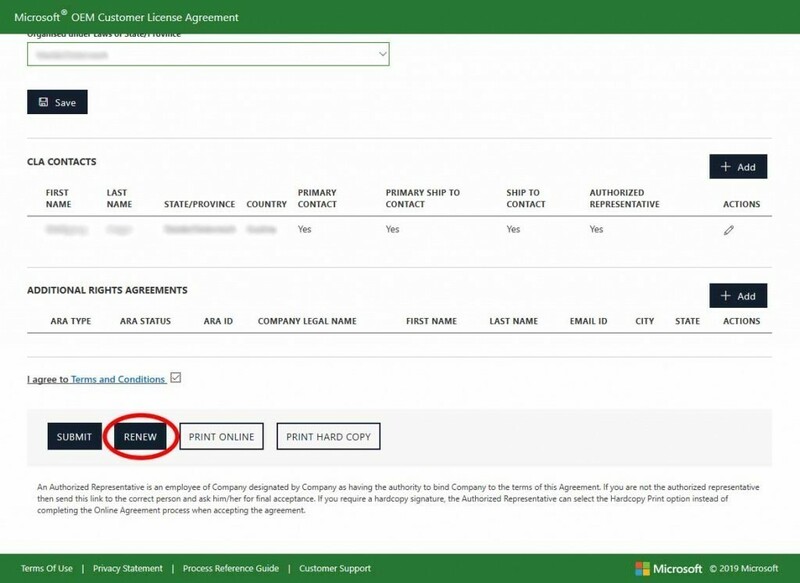 The OEM CLA is the agreement that an OEM Customers must sign in order to license MS Products through the distribution channel. 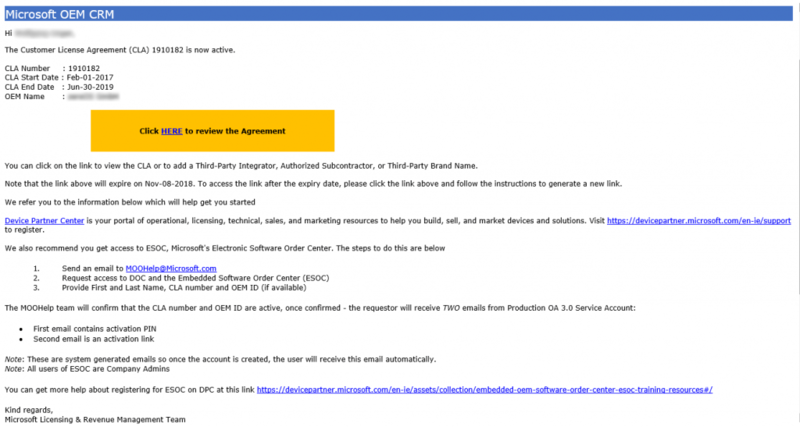 This is the primary agreement between Microsoft and the OEM Customer. Please call or email us if you need a new CLA. 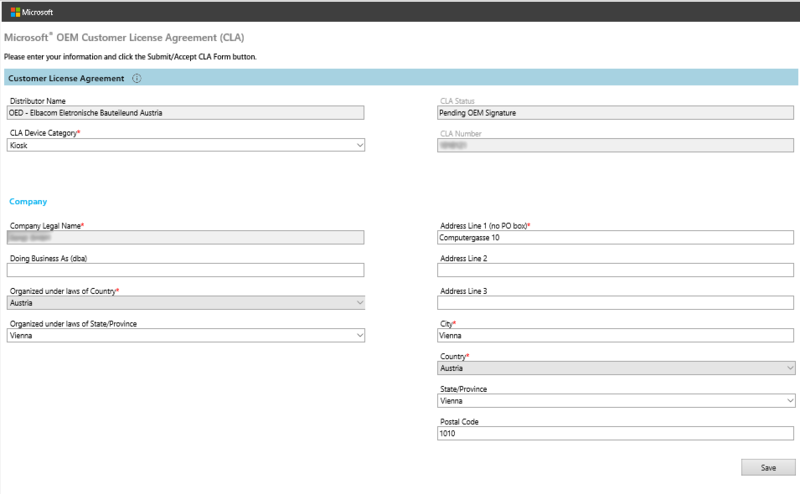 We create a new CLA in the Microsoft system and fill it with data which is available to us. 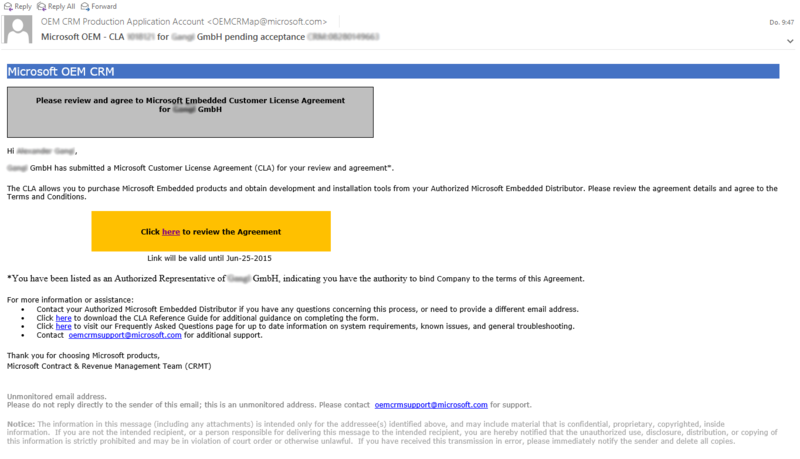 Then you get the email shown below sent directly from Microsoft. Please click on “click here”. Please fill in now all your data and click on “Save”. 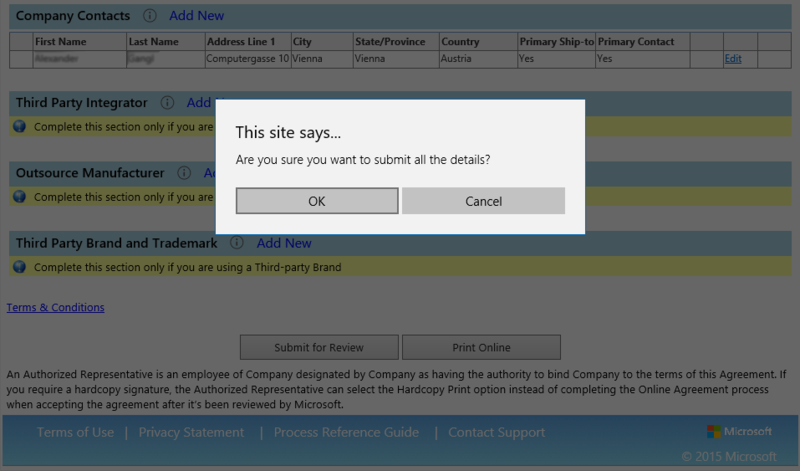 After this click “Submit for Review” and confirm the following query with “OK”. After this you will get the following message: “Thank You! You have successfully submitted your License Agreement.”. Now you should get an email from Microsoft within 2 days. 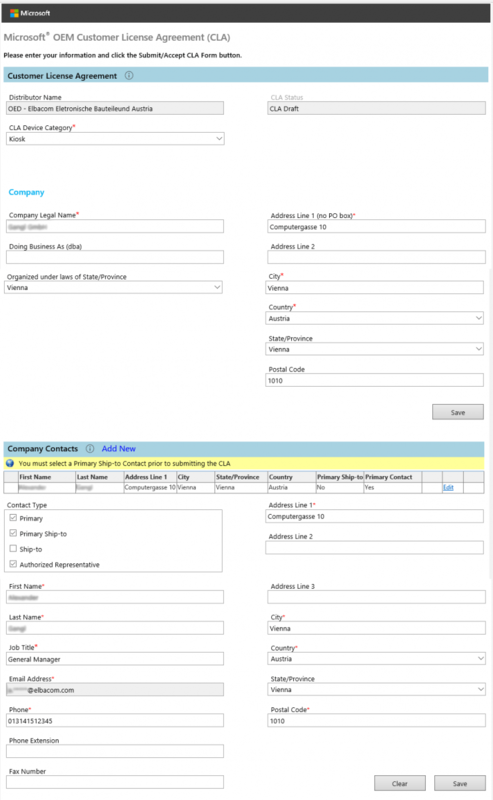 Please check the prefilled data on the following page and correct or complete it if necessary. When you are done click on “Save”. Now enter your personal data and please don’t forget to agree the Terms and Condition. Finally click on “Accept” and confirm the security check. The process is now completed successfully.